I love tea time and my scones. I have drank tea every morning since I was a little girl. I would have tea, toast, and eggs thanks to my wonderful mother who would make it for me every morning. In 1998 I was able to student teach in England and went to my very first afternoon tea. Since moving to Florida I love trying out new tea rooms. I had to try this recipe as I love blueberries. I thought this was a pretty decent scone. Bring on the Devonshire Cream! Sift all of the dry ingredients in a mixing bowl. Then add the softened butter and mix well. Next whisk the egg with the heavy cream and add it to the flour mixture. Gently blend it together to make a dough. Fold in the blueberries and be careful to not break them. Put some flour on a baking sheet. Put the dough on it and flatten into a large square. Cut the dough into a four quadrant. Then cut again diagonally. 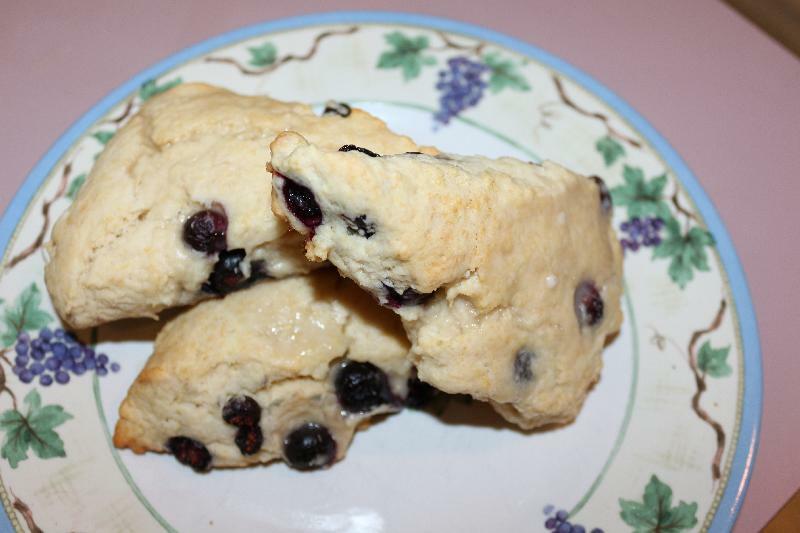 Transfer each scone onto another baking sheet. Bake for 20-25 minutes. To make the glaze put the powdered sugar in a bowl and add in the milk and vanilla. Drizzle the glaze on top of the scones and enjoy with Devonshire Cream!